And now some pictures of today's outfit taken this morning. 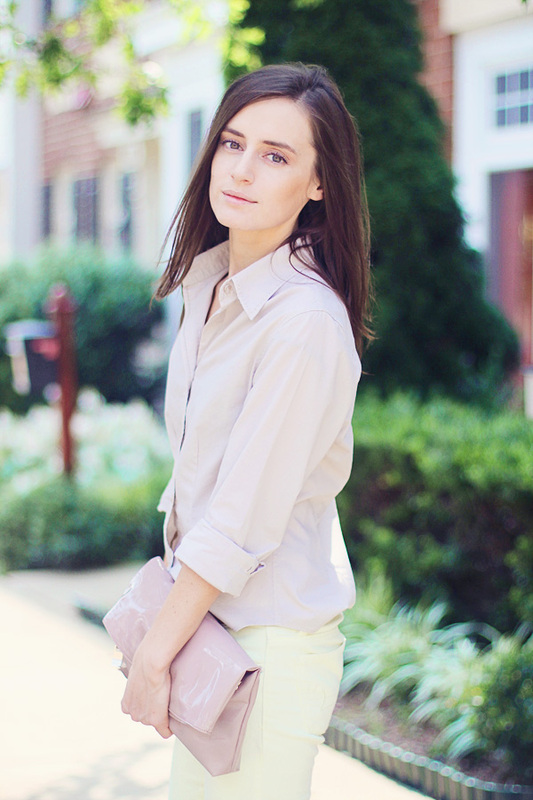 Those of you who have been following my blog for a while know how much I love pastels, right? Since I spend most of the day in the cold air-conditioned office, I decided to wear jeans and a long-sleeved shirt because I'm always freezing! But as soon as I stepped outside to grab Starbucks, I realized how inadequate I look among people in tank tops and flip flops. You look great, love the soft colors! love the colour of your jeans..... with white I love them too. God you look absolutely beautiful! love the panst, bag, blouse and adore the shoes ! Totally love your outfit. Especially the color of your pants. Good to see that you are growing! Congrats on hitting the 1000 milestone! Personally, I think you deserve way way way more. congratz for your follower have been reach 1000+.. and i love your look as usual..
beautiful pastels love the entire look so simple so clean! Loving the soft and romantic colors! love you in pastels :) i hope you keep wearing them in winter <3!! I would NEVER think to pair lavendar and lemon together but honey you sure are WORKIN' this look! Love the barely there hues...so unsaturated but full of style! Gorgeous inspiration...BEST look I've seen all day! Congratulations, that is wonderful! I adore pastels. They really suit you! Those pants are just beautiful. This two colors are so pretty together. I love those jeans! You have a great blog and style, keep up the good work! I adore the 2 pastel colours you've combined. You're such a natural beauty El. Amazing Outfit, love these pastel colors on you. Very nice! You remind me of Keira Knightley!!! Ou! I love this style! Congrats on 1000+ followers. Your blog is fabulous and I know it's a great source of inspiration for myself and other readers. Gorgeous colors! :) And CONGRATS! That is so exciting! What a beautiful outfit! And congrats to your 1000 followers, wow that's a huge mark! Wow you look so lovely dearie... Amazing! I really like your bracelet! You really look lovely El! I love your style! I'm learning from you every time. I also freeze to death from air-conditioning. You look lovely!! Love this outfit! So classy and timeless. Love the pastel colors, it really looks good on you!